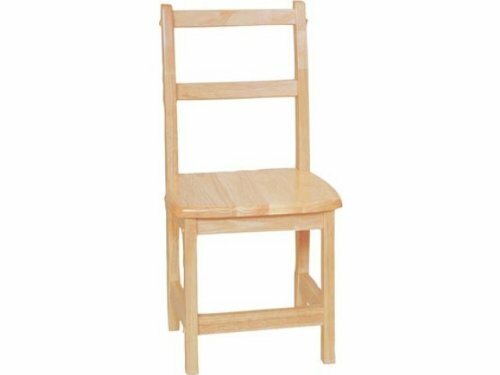 Wood Designs solid birch hardwood chairs are constructed using mortise and tenon joining methods for exceptional strength and durability. Curved back legs help prevent tipping and smooth rounded corners bring added safety to any classroom. Shipped full assembled. Non-toxic natural finish. Packed (2) per carton. Premium quality solid birch hardwood chair. Unique glue-mortise-steel pin construction is the strongest most durable joinery available. Greenguard Children and Schools certified with environmentally friendly Tuff-Gloss finish. Mortise and Tenon construction plus screwed in place wood brackets underneath seat for unbeatable strength. Promotes a healthier early learning environment. Does not emit any harmful contaminants (VOCs) into atmosphere. Manufacturers (10) year Warranty. Construction Material: Solid Hardwood. Country of origin: China. Product Dimensions: 29"Hx15.75"Wx14.375"D. Product Weight: 24 lbs.